kitchen hand at a Chinese Restaurant called the Golden Dragon. I then worked at Bremer’s 350 seat Chinese Restaurant where after 9 months I filled in as Head cook for 7 months. Then In June 1994 I was discovered by the General Manager of the Sheraton ITT Brisbane during Bremer’s busy service. It was then I stepped right into the Sheraton’s Modern culinary world at its best. We had butchers, bakers, fishmongers, pastry Chefs, stewards and everything else in between. It was there, I learnt so much including western knife skills, French, German, English, basic Italian and Mediterranean flavours and techniques. contract taking me to China for a hotel position for a year which as you can imagine was another whole new world of cookery and ingredients to explore. the upmarket European Hotel in over 50 years. Upon completing my contract for the Marritz, I worked for the Ramada in Hervey Bay doing a start-up Fine dinning restaurant & café with Guy Leech designing a completely nutritionally balanced range of menus. In 2011 I moved to Sydney to expand my personal education and explore the new look of the Culinary scene I had heard so much about. 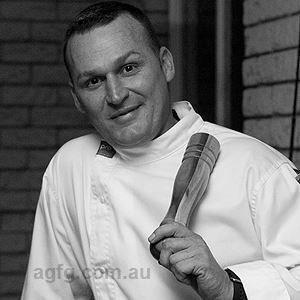 Since being in Sydney I have worked as a group Executive chef for a café group Kingston & Co. I also worked for the Hard Rock café as an Executive Chef taking me to Paris, Prague and Amsterdam and briefly back to the Gold Coast. I have done a lot of start-up work for various Hospitality groups and individuals. I have been lucky enough to have a signature dish published in The Mosman Meanders’ book. One of my great experience’s was working recently as a consultant/Executive Chef for Pepsico Australia Research & Development, designing all natural range of special edition chips for Red Rock Deli, my favourite are the Roasted Chicken Lemon & Thyme. My career has been progressive educational and various, traveling the world and making the most of the energy we call youth. I am now embarking on a learning curve in the Culinary Food Science World undertaking a Bachelor of Food Science and Technology and then I hope to be able to give nutrition back to society on a corporate level. Originally, I wanted to be a doctor – but I didn’t have the patience. First career choice was an Architect but at the age 12 I fell in love with the flavours and Fragrance’s of food, Asian cooking to be precise and that’s where a hobby became a life or career depending on your view. I combine the beautiful colours and textures that nature provides, predominantly from local area’s and experiment with old and new school techniques of our culinary world to create what I would call rustic multi cultural Australian cuisine. A Californian Raison reduction as an additive, used with red meat jus or seafood and different herb salads. My inspirations come from chefs like Matt Moran and Justin North for business and flavour combinations. Chefs like Paul Leete and Mark Best inspire me for creativity and boldness. However if I had to say one inspiration that drives me the most, it would be the fresh produce and sustainable animal proteins I get to work with. More recently for me a science degree is a natural progression and for that inspiration came to me through Heston Blumenthal. I love getting to create healthy enticing dishes that inspire people to eat nutritionally and sustainably. I am also a big fan of hospitality by definition as a way of life. As I would say: doing god’s work (feeding the masses). Berries & Seeds, Sea Salt, Szechuan pepper. Farm to Foreshore, a modern day twist on the classic Surf & Turf. 20+ yrs, so many to choose from. I’m pretty proud of the Flambé Mango & Pistachio Brulee that I produced for AGFG. I did it the first time in its own skin and it worked amazingly. Try David's Flambé Mango & Pistachio Brulee and Farm to the Foreshore.